There is a real cost involved with workplace emotional distress. Are you willing to continue to pay it, or will you protect your business’ bottom line? Emotional Terrors in the Workplace is an interesting, comprehensive, and constructive approach to adding the key ingredient of empathy into your role as a manager. Businesses need to make money or there will be no jobs. People need to have appropriate feelings or they will not be healthy. EMOTIONAL TERRORS IN THE WORKPLACE; PROTECTING YOUR BUSINESS’ BOTTOM LINE provides well-tested Emotional Continuity Management tools that bridge human emotional dynamics with the fiscal demands of a company. If you want to see the true measure of managers, watch how they treat their subordinates, not their peers. This book is about being an empathetic manager, a manager who acts with emotionally sensitive certainty and then lets those actions speak for themselves. It is NOT the fuzzy, sissy-type, right-brained mush all managers are taught to avoid. Nor is it a guide to the insincere “I feel your pain” style of management. Rather, it is a straightforward look at the cost of emotional corrosion in the workplace and how it affects the bottom line. A variety of quizzes and self-analyses will help you discover what type of manager you are and case studies connect the type of manager (and management behavior) to forecast success or the need for more effort. There are also lists of all types of employees and how to recognize the destructive emotional dislocations they can cause. A methodology for calculating the cost of emotional distress and disturbance is also included. Your business or your life has experienced a catastrophe. As companies continue to downsize and make do with fewer personnel, it is critical that all managers are able to effectively compel their teams to function at the highest levels possible. In order for optimum performance from all employees to be a reality, there must be a minimum of emotional distress in the workplace. This book is a straightforward look at the real costs of emotional corrosion in the workplace and how it affects the bottom line. It is a frank and open discussion of dysfunctional managerial and employee personality types and how to recognize and repair them. It outlines the empathetic managerial style proven time and again to be the most successful way to improve and maintain employee productivity. It is not a guide to fuzzy, sissy-type, right-brained mush, nor is it a guide to the insincere I feel your pain, style of management either. It provides well-tested emotional continuity management tools that bridge human emotional dynamics with the fiscal demands of a company. A variety of quizzes and self-analyses will help you discover what types of managers are working at your business. Multiple case studies connect the type of manager (and management behavior) to forecast success of the need for more effort. There are also lists of all types of employees and how to recognize the destructive emotional dislocations they can cause. If you aren’t convinced…a methodology for calculating the costs of emotional distress and disturbance is also included. There is a real cost involved with workplace emotional distress. Are you willing to continue to pay it, or will you protect your business’ bottom line? Emotional Terrors in the Workplace is an interesting, comprehensive, and constructive approach to adding the key ingredient of empathy into your role as a manager. Provides well-tested Emotional Continuity Management tools that bridge human emotional dynamics with the fiscal demands of a company. Readers from management and personnel will find the information equally of use. Quizzes and self-analyses help managers discover what type of leader they are, and how to adjust to a more efficient style. Vali Hawkins Mitchell, Ph.D., LMHC, jokes that she made a career choice at birth: she was born in the middle of an earthquake measuring 7.1 on the Richter scale! Dr. Vali, as she is well known, holds a Doctorate in Health Education and Masters degrees in Applied Psychology and Expressive Arts Therapy. She is a highly regarded public speaker, trainer, author, consultant, and educator. A valued mentor and keynote speaker, she offers critical insights on the real human factors of disaster and emergency planning based on her experiences with major events such as the World Trade Center, Hurricane Katrina, Samoan earthquakes, the Indonesian tsunami, and Pacific Northwest Wildfires. She is considered by many as the leading authority in the growing field of Emotional Continuity Management. Academically, Dr. Vali has been adjunct faculty member and guest lecturer at a number of universities and colleges, including Washington State University, the World Medicine Institute, and Lane Community College. 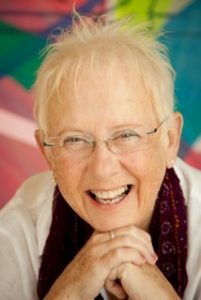 She has contributed original research in the area of Psychosocial Dynamics of Families with Pediatric Illness, Tools of Trauma Management for Emergency Care and Health Care Delivery Professionals, and the Use of Quantum Poetry for Trauma Management. As a counselor, she has been trained by the American Red Cross as a Disaster Mental Health provider and National Diversity Instructor, and has been engaged by the US Department of Defense to consult directly with military families, veterans, and service members in all branches since 2009. As a business consultant and educator, Dr. Vali travels extensively, providing custom-designed trainings for individuals and teams, private and government agencies and businesses from mom-and-pop companies to large corporations. 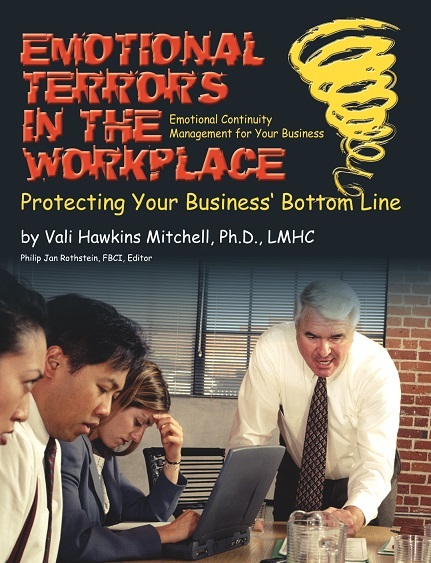 Dr. Vali is the author of Emotional Terrors in the Workplace Protecting Your Bottom Line; Dr. Vali’s Survival Guide: Tips for the Journey; Preparing a Go-Bag; and a number of plays, musicals, and children’s titles. She is a performance musician and award-winning artist. She is a Registered Expressive Arts Therapist (REAT) and is based in Seattle, Washington. 1 ROTATIONS: WHAT IS SPINNING? 2 RISKS: HOW DOES SPINNING AFFECT THE BOTTOM LINE? 3 RECOGNITION: WHAT DOES SPINNING LOOK LIKE? 4 REFRAMING: WHAT DO SPINNERS LOOK LIKE? 5 RESPONSES: HOW CAN YOU MANAGE SPINNING? 6 REACTIONARIES: HOW DO YOU MANAGE EMOTIONAL TERRORISTS? In What Do You Have Faith? What Is Your Duty to Warn? What, Where, When, Who, How, Which, How many, How often? Self-care Questionnaire: Do I Want to Be a Manager? What Are the Mission Statements of These Companies? 15 REDUCTIONS, RUINS, AND RUBBLE:WHEN ARE THE SPINS FROM DISASTERS THE ULTIMATE SPIN? 16 REHEARSAL: WHY PLAN, EXERCISE, AND DRILL FOR THE UNEXPECTED? 17 RESOURCES: DO YOU HAVE GOOD INFORMATION? Reasonable variations of human emotions are expected at the workplace. People have feelings. Emotions that accumulate, collect force, expand in volume and begin to spin are another matter entirely. Spinning emotions can become as unmanageable as a tornado, and in the workplace they can cause just as much damage in terms of human distress and economic disruption. All people have emotions. Normal people and abnormal people have emotions. Emotions happen at home and at work. So, understanding how individuals or groups respond emotionally in a business situation is important in order to have a complete perspective of human beings in a business function. Different people have different sets of emotions. Some people let emotions roll off their back like water off a duck. Other people swallow emotions and hold them in until they become toxic waste that needs a disposal site. Some have small simple feelings and others have large, complicated emotions. Stresses of life tickle our emotions or act as fuses in a time bomb. Stress triggers emotion. Extreme stress complicates the wide range of varying emotional responses. Work is a stressor. Sometimes work is an extreme stressor. Since everyone has emotion, it is important to know what kinds of emotion are regular and what kinds are irregular, abnormal, or damaging within the business environment. To build a strong, well-grounded, value-added set of references for professional discussions and planning for Emotional Continuity Management a manager needs to know at least the basics about human emotion. Advanced knowledge is preferable. Emotional Continuity Management planning for emotions that come from the stress caused by changes inside business, from small adjustments to catastrophic upheavals, requires knowing emotional and humanity-based needs and functions of people and not just technology and performance data. Emergency and Disaster Continuity planners sometimes posit the questions, “What if during a disaster your computer is working, but no one shows up to use it? What if no one is working the computer because they are terrified to show up to a worksite devastated by an earthquake or bombing and they stay home to care for their children?” The Emotional Continuity Manager asks, “What if no one is coming or no one is producing even if they are at the site because they are grieving or anticipating the next wave of danger? What happens if employees are engaged in emotional combat with another employee through gossip, innuendo, or out-and-out verbal warfare? And what if the entire company is in turmoil because we have an Emotional Terrorist who is just driving everyone bonkers?” The answer is that, in terms of bottom-line thinking, productivity is productivity — and if your employees are not available because their emotions are not calibrated to your industry standards, then fiscal risks must be considered. Human compassion needs are important. And so is money. Employees today face the possibility of biological, nuclear, incendiary, chemical, explosive, or electronic catastrophe while potentially working in the same cubicle with someone ready to suicide over personal issues at home. They face rumors of downsizing and outsourcing while watching for anthrax amidst rumors that co-workers are having affairs. An employee coughs, someone jokes nervously about SARS, or teases a co-worker about their hamburger coming from a Mad Cow, someone laughs, someone worries, and productivity can falter as minds are not on tasks. Emotions run rampant in human lives and therefore at work sites. High-demand emotions demonstrated by complicated workplace relationships, time-consuming divorce proceedings, addiction behaviors, violence, illness, and death are common issues at work sites which people either manage well — or do not manage well. Low-demand emotions demonstrated by annoyances, petty bickering, competition, prejudice, bias, minor power struggles, health variables, politics and daily grind feelings take up mental space as well as emotional space. It is reasonable to assume that dramatic effects from a terrorist attack, natural disaster, disgruntled employee shooting, or natural death at the work site would create emotional content. That content can be something that develops, evolves and resolves, or gathers speed and force like a tornado to become a spinning energy event with a life of its own. Even smaller events, such as a fully involved gossip chain or a computer upgrade can lead to the voluntary or involuntary exit of valuable employees. This can add energy to an emotional spin and translate into real risk features such as time loss, recruitment nightmares, disruptions in customer service, additional management hours, remediations and trainings, consultation fees, Employee Assistance Program (EAP) dollars spent, Human Resources (HR) time spent, administrative restructuring, and expensive and daunting litigations. Companies that prepare for the full range of emotions and therefore emotional risks, from annoyance to catastrophe, are better equipped to adjust to any emotionally charged event, small or large. It is never a question of if something will happen to disrupt the flow of productivity, it is only a question of when and how large. Emotions that ebb and flow are functional in the workplace. A healthy system should be able to manage the ups and downs of emotions. Emotions directly affect the continuity of production and services, customer and vendor relations and essential infrastructure. Unstable emotional infrastructure in the workplace disrupts business through such measurable costs as medical and mental health care, employee retention and retraining costs, time loss, or legal fees. 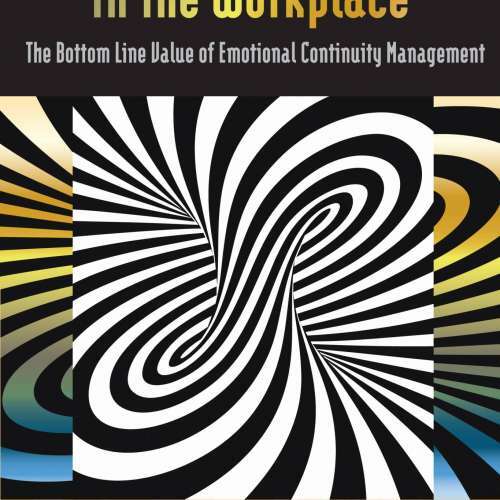 Emotional Continuity Management is reasonably simple for managers when they are provided the justifiable concepts, empirical evidence that the risks are real, a set of correct tools and instructions in their use. What has not been easy until recently has been convincing the “powers that be” that it is value-added work to deal directly and procedurally with emotions in the workplace. Businesses haven’t seen emotions as part of the working technology and have done everything they can do to avoid the topic. Now, cutting-edge companies are turning the corner. Even technology continuity managers are talking about human resources benefits and scrambling to find ways to evaluate feelings and risks. Yes, times are changing. Making a case for policy to manage emotions is now getting easier. For all the pain and horror associated with the terrorist attacks of September 11, 2001, employers are getting the message that no one is immune to crisis. In today’s heightened security environments the demands of managing complex workplace emotions have increased beyond the normal training supplied by in-house Human Resources (HR) professionals and Employee Assistance Plans (EAPs). Many extremely well-meaning HR and EAP providers just do not have a necessary training to manage the complicated strata of extreme emotional responses. Emotions at work today go well beyond the former standards of HR and EAP training. HR and EAP providers now must have advanced trauma management training to be prepared to support employees. The days of easy emotional management are over. Life and work is much too complicated. Significant emotions from small to extreme are no longer the sole domain of HR, EAP, or even emergency first responders and counselors. Emotions are spinning in the very midst of your team, project, cubicle, and company. Emotions are not just at the scene of a disaster. Emotions are present. And because they are not “controllable,” human emotions are not subject to being mandated. Emotions are going to happen. Many twenty-first century organizations are beginning to agree that, to be comprehensive, Business Continuity Planning must include managing people’s emotions. They are discovering that a system-wide approach to creating an emotionally spin-free workplace, means preparing themselves and all employees for potential emotional impact, thus lowering the risks of collective system-wide spinning. This planning also prepares everyone for rapid recovery no matter the size or conditions of the impact event. Organizations that develop Emotional Continuity policy, procedures, practice drills, multiple resources, and management tools are more ready to withstand whatever comes along with a healthy rapid-recovery mentality. Good days are good. Bad days are bad. But what happens if things go terribly, terribly, terribly bad? Then what? When there is a local, regional, state or national disaster, some official has to “call” it a disaster. Governmental agencies are generally responsible for officially “declaring” when an event is of worthy merit to be defined within the rigorous guidelines and definitions to qualify an event or incident as a “declared” disaster. These official standards and markers control funding, emergency relief services, public assistance, debris clearance, repair, demolitions, replacements, housing, loans, grants, counseling, health care services, search and rescue, transportation, mass care, mutual aid, changing regulations, tax relief, restoration costs, corpse removals, some litigations and legal implications and exemptions, and immediate and long term financial support or relief. In other words, if it is a “REAL” disaster, it counts for something and procedures are put in place to aid recovery. Rapid recovery happens only after the official has decided it is officially official. Sometimes this happens with astonishing rapid speed and other times it can take what seems like a lifetime. In the meantime, people may be waiting and can be terribly upset and distressed. They know it was a disaster because they are sitting in the rubble that used to be their organized lives. The earthquake hit at 8:34 a.m. The epicenter was on the west side of Washington State which was declared an official disaster. FEMA (Federal Emergency Management Agency) was on the scene quickly to give support and manage media coverage. Teams evaluated damage and made dollar assessments. Across the state, on the east side of the mountains, the earthquake was recorded as minor and these counties were not within the official disaster area. They did not qualify for FEMA response. The Skinners, who lived in a rural county, discovered that their driveway, the only entrance to their home and their home-based business, had buckled. The way the highway was set, their customer-based productivity depended on the turn-around in their driveway off the highway. Someone suggested the earthquake might have caused it. This idea had not occurred to them so they began making phone calls. No one had claimed any damage in the county. As channels began to shift, FEMA was suspicious but officially polite and came to their home to evaluate. After seeing the damage, the FEMA representative did a thorough investigation and discovered that their brick home had been split down the middle. The representative was clear that indeed this was earthquake damage and helped them file a report. Within 24 hours the county had received FEMA’s report and was declared an official disaster area. Other people started calling with damage reports of disrupted hot water heaters, cracked fences, well damage, and various effects of the tremblor. The Skinners received a check from FEMA that helped pay for the repair of the driveway. FEMA paid $732.00 for the driveway. The damage from disrupted services was a loss of approximately $24,000 in revenue. Learning Byte: The Skinners were happy with FEMA. Their representatives were courteous and professional and didn’t treat the couple like they were trying to bilk the system. But they did wait a long time to get financial help. The neighbors, who had waited longer to report, became angry that FEMA had not come sooner and rallied together in angry meetings. Several home businesses and farms had delays, loss of productivity, and additional expenses incurred prior to the official declaration of disaster. DO THIS: Learn how disasters are officially declared in your city, county, and state. New Homeland Security regulations may determine how disaster services work in your area. The failure to adequately address the victims and the emotional dimensions of corporate problems is what changes adverse events into crises and catastrophes. Buildings can be replaced; machines can be fixed; products can be re-engineered and re-marketed; but leaving the needs of victims unmet, denied, or trivialized, and failing to address the emotional impact of events and behaviors can cause permanent damage and often defines careers. EMOTIONAL TERRORS IN THE WORKPLACE: PROTECTING YOUR BUSINESS’ BOTTOM LINE is an interesting, comprehensive, and constructive approach to adding this key management ingredient to the manager’s role. This book’s goal is to arm the individual with enough information and structure to persuade the boss to take a shot at adding this skill and knowledge that will help managers and leaders preempt or at least begin to recognize the signs of corrosive emotional distress. Two great weaknesses of today’s business and management education are the intentional de-emphasis of the emotional component of work and working life, and only the flimsiest, most circumspect teaching of integrity and workplace ethics. These concepts are, in reality, connected. When a boss has difficultly managing or even acknowledging the emotional dimension of problems, the first response of observers is to question the ethics, humanity, or empathy of the manager faced with the problem. From the perspective of the victim of such behavior, the thoughtless, dollar-driven manager seems more like a perpetrator, rather than someone who is uncomfortable with the circumstances of the problem. Management, as the author cites from time-to-time, hates this stuff. It’s the fuzzy, mushy, sissy-type, right-brained stuff managers have been trained to ignore and, in fact, remove from their management skill set from the instant they begin their graduate school training. This aversion is powerful. Management remains unwilling to learn even though there are important and fairly frequent publicly embarrassing circumstances, which one might think would help business leaders “get it.” I refer to this as the “General Patton Syndrome.” During World War II, Major General George Patton slapped a soldier in a field hospital because the soldier ran from battle. Patton called the man a “coward,” a “sissy,” and a “sympathizer.” His single act struck like thunderbolt throughout the military. General Patton was disciplined and made to publicly apologize. Did it change the views of military leaders and commanders about cowardice in battle? Probably not, but military leaders don’t go around slapping solders anymore, at least not in public. Today’s business managers still approach emotional issues and questions more like General Patton – if you get emotional, you are disloyal, or malingering, or distracting yourself and others from important efforts, and even, heaven forbid, sabotaging management’s best efforts. One of the most powerful concepts explored by Vali Hawkins Mitchell in this book is the difference between arrogance and empathy. Today’s managers are taught to be arrogant, that is, to make decisions based on criteria that are totally objective (read “non-emotional”) and totally measurable and justifiable (read “fit a kind of dispassionate formula or structure”). This results in behaviors and attitudes that are cold, hard, and so seemingly callous as to be driven only by success measured in dollars, bonuses, and options. What is management’s excuse? Management has such difficulty answering this question that they conduct a reactive exercise I call “Death by Question.” How can you measure emotion? How do you quantify empathy? How do you calculate the value of an apology? It’s the old and false notion that management is science. In fact, management is far more than science. Arrogance is making decisions for others without their participation or permission. Empathy, on the other hand, is frequently confused with sympathy, which is the verbalization of concern or recognition that someone else is about to or is suffering something that the sympathetic observer had no hand in and cannot help with. Empathy, in reality, is what is done to alleviate, replace, or be the substitute for someone else’s pain, suffering, agony, or emotional distress. Saying we are sorry or that we recognize someone else’s pain is meaningless and often comes across as superficial and insincere. Empathy is all about doing something for that individual, relieving the pain, solving the problem, soothing the emotional distress, or even standing in the victim’s place to suffer the potential for danger or threat. This book is about being an empathetic manager – a manager who acts with emotionally sensitive certainty then lets those actions speak for themselves. The reader will find a variety of quizzes and self-analyses sufficient to determine their management archetype: cold, arrogant, intrusive, abusive, reclusive; or, warm, effusive, helpful, or empathetic. This book is an eye-opener. There are many case histories with frequent efforts to connect the type of manager and management behavior to forecast success or the need for more effort. There is an interesting methodology for calculating the cost of emotional distress and disturbance. There are lists and descriptions of all types of employees and managers, and how to recognize the destructive emotional dislocations that category can cause. – James E. Lukaszewski, ABC, APR, Fellow PRSA; Chairman, The Lukaszewski Group. James E. Lukaszewski, ABC, APR, Fellow PRSA; Chairman, The Lukaszewski Group. “Vali Hawkins Mitchell has produced an unusual and authoritative work. Packed with case study and “sound bytes,” Vali will touch the corporate nerve and conscience. The words addressing what it was really like for the people touched by the aftermath of the events of 9/11 are particularly telling. Julia Graham FBCI; Director of Risk Management, DLA LLC (United Kingdom); Board of Directors, the Business Continuity Institute.